Just because you are at the stadium watching one team does not mean you stop caring about the other teams in the world. That’s where ESPN ScoreNet comes into play, as it allows you to follow the scores and news from all different sports in one convenient place. 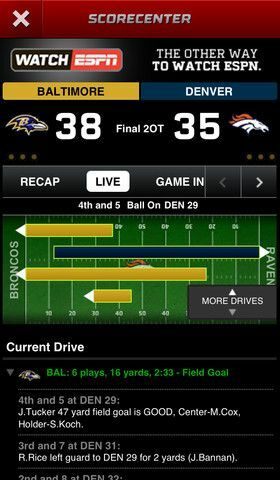 Also, because this app updates live, you can use it to monitor the stats at the game you are currently watching. Sometimes it can be hard to find out this information at the arena, and ScoreCenter has you covered. 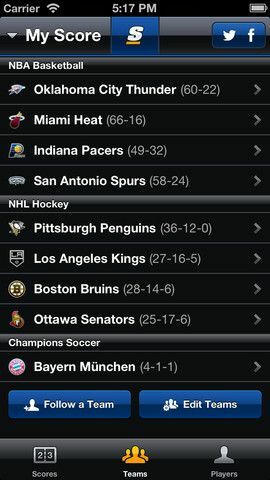 This is another great app to get live sports scores. It’s incredibly fast, and it comes with a smooth interface that makes it easy to follow games as they happen. Of course, it will come down to a matter of preference whether you want to use this or ESPN’s app, but either way, they will both do a stellar job of letting you keep track of the wide world of sports, or just the game you are currently watching. Optionally you can just use both, and get a full information overload.